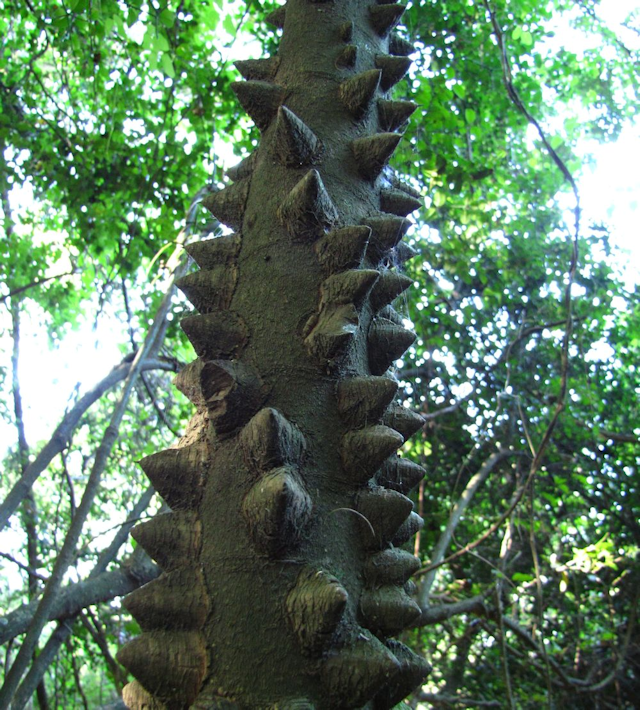 Common name: small knobwood; Zulu name: umlungumabele; Afrikaans name: kleinperdepram. During winter months, the mistbelt forests of the midlands open up a little. The canopies let in more light and the understory shrubs are less dense. This means that some trees become more visible or easier to get close to. One such species is the Zanthoxylum capense - impossible to miss and probably one of the first trees people new to forests learn as it is so distinct. The trunk is covered in cone shaped knobs. The Zulu and Xhosa name for the tree is amusing - umlungumabele which means ‘breast of a white woman’. Apparently this refers to the fact that white women wore bras which made their breasts appear more pointed, unlike the local women. The Afrikaans name kleinperdepram means ‘small horse breast’. Zanthoxylum is a member of the citrus family. The fragrant white flowers are much favoured by insects, the crushed leaves smell of lemon and shiny black seeds are rich in fragrant essential oils and have been used as perfume. Traditionally twigs were used as toothbrushes and decoctions of bark as an antibacterial mouthwash, ground roots or leaves inserted into a tooth cavity for toothache.